World War - a game mode involving battles on a global map. Conflict will occur in the format of "operations", which include dozens of individual battles. The game mode differs significantly for the commander, officers and ordinary members of a squadron. 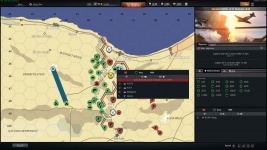 Commanders and officers are able to choose which operations their squadrons will participate in, move forces in real time on the operational map and initiate battles. 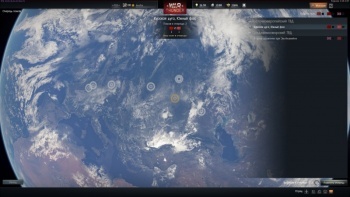 Every squadron can participate in “World War” by selecting an operation on the global map. The commander chooses an operation and selects one of the two sides in the conflict. In participating in a single operation, a squadron can not change sides. 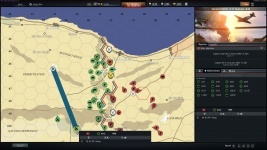 The world war operation screen is divided into two main sections: the operation screen where all in-game actions take place, and the information panel which displays additional details about objects on the operational map, operation objectives and the events log. Operational command (moving the armies on the map) is available for commanders and the officers in each squadron. Privates can only choose and join battles. Armies are combat units on the operational map. Armies are colour-coded: the opponent’s armies are red, allied armies are blue, and your armies are green. Icons indicate the army type: armour, aircraft, infantry or artillery. Armies can capture territory and participate in battles. Each army consists of a specific number of vehicles, the loss of which means the loss of the army. Read more details about the features of different armies and how to control them on the Armies page. Airfields serve as a base of operations for air forces. The airfield icon displays the number of available aircraft for your army group. When you select an airfield, you can see detailed information about it and order aircraft to take off. The operational map is divided into sectors that define control of the territory and the front line. Each sector can be neutral or belong to one of the sides. Key sector has a brightly coloured border denoting who currently holds it. Often control over these sectors means victory for the attacking side and the more the key sectors owned then the faster reinforcements will arrive. Sectors must be controlled in order to complete mission objectives. The sector must not contain the ground armies of the side that previously controlled the sector. The sector must contain at least one ground army of the capturing side or the sector must be cut off from the rear (surrounded on all sides by sectors of the attacking side). When these conditions are met, the other side gets control of the sector. Also, a sector that is cut off from the rear (surrounded on all sides by the opponent’s sectors) and contains no ground armies of the defender, is considered captured and automatically changes its side. The main screen for the operation commander: army management, log and other functionality available. In addition to the tactical control of the armies it is also necessary to take into account the type of terrain over which the army will move. Different parts of the operational map have different types of terrain. The type of terrain affects both the speed of ground forces and the type of missions created for ground battles in this map section. Each operation is unique. If you choose to fight on the European front? Prepare to slowly make your way through forests and rivers.. In addition to the movement of troops it is necessary to monitor their status and any statistics of all controlled armies as well as the readiness of reinforcements, the morale of the armies and many other indicators that are important for victory. For these purposes each commander has a control panel. In each operation, both sides of the conflict have a list of objectives. Completing any of the main operation objectives leads to victory. By clicking on the “List of objectives” button, you can see the full list of tasks, as well as detailed descriptions of them. If you need to capture specific sectors to complete an objective, you can view these sectors on the operational map by hovering the mouse over the list of sectors in the objectives list. In the operational log, you can see the complete list of events from the beginning of the operation. Log filters allow you to display only relevant types of messages on screen. You can hover the cursor over a sector to highlight it on the operational map. You can select an army directly in the log, if it is still present on the operational map. You can go to the battle screen if a battle is still in progress, or view the results if it has already ended. Commanders - In this tab, you can see the list of squadrons in this operation. Reinforcements - In this tab, you can view all of your reinforcements divided into two lists: ready and not ready for deployment. Armies from the first list can be deployed by selecting the relevant army and right clicking anywhere in the reinforcement sector. For armies that are not ready, the time remaining until reinforcements arrive is shown. Airfields - The “Airfields” tab contains complete information on the state of armies at all airfields. After selecting an airfield from the list, you can view the list of aircraft ready for takeoff, as well as the list of armies that have recently returned to the airfield and are currently preparing for a repeat flight. Armies - All armies under your control are listed here, divided into groups according to their current status. Armies are combat units on the operational map. Click the left mouse button on an army to select it and give it orders or view additional information about it. To create a complex route, you can hold the “Shift” key and create a route by clicking the left mouse button. The order to stop or cancel the current action is "S". The army panel contains all the information about the army. The army's status is indicated by an icon. Possible statuses are: Idle, On the Move, In Battle, Entrenched, or Entrenching (with end timer). The army's main vehicle type and quantity. If the army does not have enough vehicles, it is considered eliminated and disappears from the operational map. List of vehicles – a complete list of the army’s vehicles, where you can see the quantity and ammunition (for aviation armies). Shift + LMB allows you to create a route with several points or add points to an existing one. S – stop. It stops the army and can also function as a cancellation of the current action, such as entrenchment or an artillery salvo. A confrontation between two opposing armies leads to a battle (not always true for confrontations between ground and aircraft armies. In a confrontation, armies are moved to the battle point and lose the ability to move until the battle is over. Ground forces cannot move through an ongoing battle. If an army attempts to do this, it will be pushed back and stopped. Armour and infantry armies have the ability to entrench themselves. An entrenched army receives significantly less damage from an artillery strike and fighting such an army will create Defence missions, where the defenders will have all the advantages. Entrenchment takes time. After you give the order, you can see when the army will be entrenched in the army description. A defeated army that has not been destroyed according to the battle results retreats in the opposite direction, away from the opponent, losing its previously held position and its “Entrenched” status, if it had it. Retreating aircraft armies stop responding to orders and return to the airfield. Indicates the army’s morale level. Morale rises with every victory and falls with every defeat. 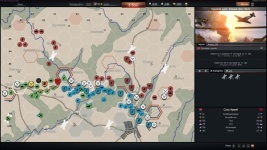 An army with zero morale surrenders to the enemy based on the battle results and disappears from the operational map. Ground forces located in a sector without a link to the rear are considered encircled. Such armies begin to lose supplies and will be destroyed after a certain period. Encirclement is a very effective tactic! It is much easier to clear an army from the operation not by fighting but by using skillful tactical choices by the commander. Encirclement - extremely effective technique! It is much easier to erase an army of operations are not in a battle, and skillful actions of the commander. If there are not enough troops left in an army, it is considered destroyed and disappears from the operational map. To create an aircraft army, you must select an airfield and specify a point of movement (right click), as with any other army. This will open the aircraft army creation window, where you must specify the aircraft and quantities for the army and choose the armament presets for each vehicle. You can only depart from the airfield within limitations: there are minimum and maximum army sizes. Each aircraft that flies out of the airfield receives armament. In battle, you can only use the selected preset. If, according to the battle results, the aircraft was left without bombs, rockets or torpedoes, then in the next battle this aircraft can be used without these munitions. Reloading such munitions can only take place at the airfield. Aircraft armies can spend a limited amount of time in the air, and the flight time for each aircraft depends on the maximum possible fuel load for each aircraft. The flight range of an air army will be calculated based on the minimum flight range value from all the aircraft. When the time runs out, the aircraft army returns to the base. During a battle, the fuel load for the aircraft will be calculated based on the remaining flight time. Only an air army can intercept another air army, so any encounter between an air army and a ground army does not trigger the start of a battle. However, when an air army stops, it will attack any ground army located below it. Tip: The air army will remember a target if you specify the enemy’s army as the end point of the flight path. The air army will not pursue this target, but if it stops above several enemy armies, one of which has been stored as a target, then the attack will be carried out on this target. The ability to launch an artillery strike on an area. All armies, including allied armies, located inside the strike radius lose their vehicles. Losses are determined by the percentage of the army located inside the strike radius, as well as whether the army is entrenched or not. The strike itself takes place in several stages. First is the guidance stage, followed by a series of volleys. Artillery can fire up to three volleys at a time, if there are enough shells. Shells for artillery strikes are supplied one at a time at regular intervals.Reinforcement does not occur if an artillery army has lost contact with the rear. Artillery armies cannot be entrenched, while battles with aircraft always take place in Defense mode. Battles with ground forces are automatic and always lead to the destruction of the artillery army. A battle is a confrontation between several armies. With rare exceptions, a battle in World War is a PvP mission where players use their armies’ vehicles to complete the mission objectives and achieve victory. The easiest way to join a battle in an operation is to click the “To Battle” button, it will put you in the queue for one of the combat operations where there are free places for your team. 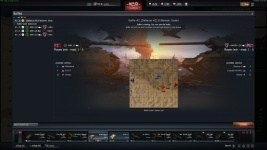 If you want to join a particular battle, you can do it by clicking on the battle icon on the operational map – it’s a round icon with crossed swords. White – the battle has not yet begun. Yellow – the battle is getting ready to start. Red – the battle has started, there are available places for players on your team. Black – the battle has started, your team does not have any available places for players. Gray – the battle is in automatic mode. The number of available places in battles already started or being prepared does not exceed 5. The number of battles already started or being prepared is more than twice the number of regiments participating in the operation. Battles change to the “Getting ready to start” status in the order in which they appeared on the operational map. A ready battle begins after one of the players enters the queue for this battle. The battle will begin even if the queue contains players from only one team, but there is a delay before the start of each battle to allow players of both teams to assemble. If there are more people in the queue for the starting battle than the maximum number of players in the team, those who have queued earlier will get into the battle, but players of the squadron whose armies are participating in the battle take priority over other players. If there are empty places on your team in a battle that has already started, you can join it at any time after it starts and before it ends. Some battles in an operation are automatic. These battles take place without the participation of players, and the result is determined automatically. Auto battles start outside the main battle queue and bypass all start requirements. Auto battles are not instant; the battle result will be available only after a certain period. Different types of battles that occur simultaneously: with participants and free places (red), waiting (yellow), automatic (black), queued (white). The type of terrain does not affect the choice of the mission location. In battle, only the vehicles present in the armies participating in this battle are used, but it may not be available to the players – depending on the mission, some of the army’s vehicles may be controlled by the AI. 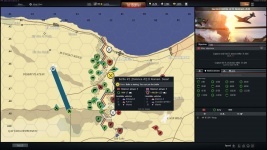 Any losses, no matter if the player or the AI was in control, are recorded as the army’s losses, and if a vehicle is lost in the middle of battle, respawning will no longer be possible. World War uses a respawn mode that reflects the confrontation between armies. Armies have a limited set of vehicles available for participating in battle, and they are randomly distributed among the players. Several vehicles are available to the player. Vehicles are selected at random from the event list, and the probability of obtaining a particular model depends on the remaining number of vehicles among the team. The available vehicles and quantity are distributed among the players of the regiment. If the player chooses to respawn available vehicles, other members of the squad or regiment will be able to join the battle on the remaining vehicles. After taking a vehicle into battle, you must wait at least 60 seconds before taking the next vehicle. An air army can be added to a battle in progress, but only if another air army is not already participating in the battle on this side. If the battle has already begun, the currently issued vehicles will not change for players, but each subsequent vehicle that players receive may be an aircraft. Since each mission follows a confrontation between aircraft already in flight, another defining feature of World War missions is the absence of airfields. Instead, there are safe exit zones on the maps. If a player abandons an aircraft in a safe exit zone, the aircraft is recorded as a survivor and will not be deducted from the army, but it will no longer be available for use in this battle. This page was last edited on 12 September 2018, at 10:03.